Click here to DOWNLOAD "Your Right to Know" Sunshine Week article. Officers. NPW's own Lori Potter, Kearney Hub ag and natural resources reporter, is now first vice president of the national organization! In addition, Barb Micek of Fullerton, Nance County Journal editor, is the NFPW historian. We're proud of both and give them our full support. Sweepstakes Award. 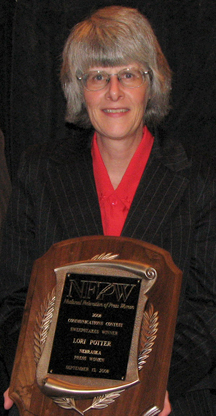 Highlight of the 2008 NFPW convention in Idaho Springs, Idaho, was the presentation of the national communications contest Sweepstakes Award to Lori Potter (pictured left). Shocked though she was, Potter still managed to deliver an inspirational and motivational acceptance speech. 2011. NFPW accepted the joint bid from Nebraska Press Women and Iowa Press Women to host the 2011 NFPW Convention in Omaha/ Council Bluffs. Pre and Post convention tours will need to be planned as well as the convention program, so it will be a big job but a fun one as we work with our Iowa neighbors.